alaTest has collected and analyzed 12 reviews of Philips Hue White Ambiance 9.5W A60 B22. The average rating for this product is 5.0/5, compared to an average rating of 4.5/5 for other products in the same category for all reviews. We analyzed user and expert ratings, product age and more factors. 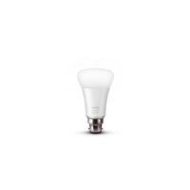 Compared to other products in the same category the Philips Hue White Ambiance 9.5W A60 B22 is awarded an overall alaScore™ of 89/100 = Very good quality. I really enjoy how you can change the temperature of light with this product really warms up the feel of the house during the winter months! I already using Philips Hue on most of my lighting in my flat. This is just addon. I can tell Philips Hue light are wroth the cost if you want to go to smart lighting route. Works great, nice way to wake you up in the morning, useful product. I use these bulbs in our hallway paired with a Hue motion sensor - never need to touch the light switch again. It's pretty perfect cause it's on as soon as I open the door and after dark it can be set dimmed so as not to blind you! Does what its meant to do! Soft light, dimmable and can be linked to Alexa. Great value for money from Very! These bulbs are great. The sleep and wake routines on the app/bridge work really well. The brightness is also very good. They have great range between very bright energizing white and a relaxing (great for bed time reading) almost soft orange colour.